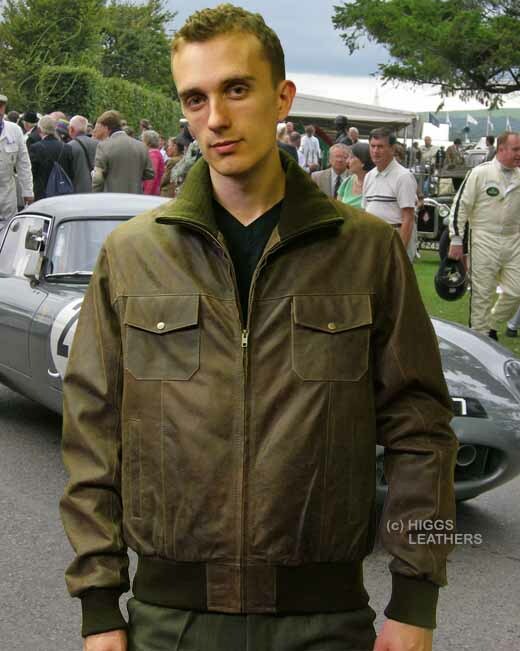 Extra soft "Distressed" Antique Brown shade (last few in this colour, please enquire) men's Leather Bomber jackets. The "Distressed" finish lets the natural markings in the skins show through, giving an uneven "Antique" effect, making these jackets very practical as any surface marks tend not to notice! The collar can be worn turned back as pictured, or zipped up high in he neck. Collar, cuffs and hips band are made from toning brown ribbed knitting. Comfortable straight cut body and sleeves. Two full sized lower pockets plus two smaller chest pockets that fasten with Antique metal studs. Two wallet sized inner pockets (one with a zip) and a mobile phone pocket, all edged with leather. Fastens with a strong Antique metal zip. Toning brown Polyester lining with soft lightweight thermal interlining for extra warmth (can be ordered without the interlining, please enquire). Also available in soft quality Black or Dark Brown Lamb Nappa Leather. Jacket length approx. 26" (66cm).